Safety, De-stigmatization and Resources should be kept in mind when interacting with people living with Schizophrenia. Keeping dignity and respect in mind will help with rapport building. 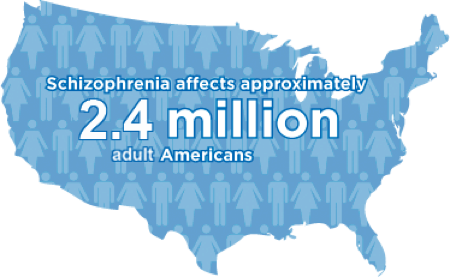 Schizophrenia Spectrum represents a range of psychotic disorders that include Schizophrenia, Substance/Medication-Induced psychotic disorders, Psychotic Disorder due to another medical condition and other associated psychotic disorders. Psychosis is defined by key features that include delusions, hallucinations and disorganized thought and speech. Hallucinations can be in all of the sensory modalities, but are most commonly experienced as auditory or visual false sensory experiences. Delusions are strongly held false beliefs that do not change despite evidence that these beliefs are implausible. A person with Psychosis may hear voices or other intrusive noises in the background while you are talking, making it difficult for them to communicate. Reassurance rather than attempts at logic can be more effective with individuals who are delusional. Remember that their beliefs or hallucinations seem very real to them. Refer back to Active Listening, and try to listen for themes in the individuals words that might inform you regarding their distress. Obtain collateral information whenever possible regarding prior psychiatric illness, psychiatric care, medication compliance and the presence of illicit or overdosed medication and/or alcohol. Choose one problem at a time so as not to overwhelm the psychotic individual. Give specific behavioral instructions, e.g., “Bill, please stay where you are”. Be respectful, supportive and kind without tolerating any dangerous or aggressive behavior. “Worldwide prevalence estimates range between 0.5% and 1%. Age of first episode is typically younger among men (about 21 years of age) than women (27 years). Of persons with schizophrenia, by age 30, 9 out of 10 men, but only 2 out of 10 women, will manifest the illness. Persons with schizophrenia pose a high risk for suicide. Approximately one-third will attempt suicide and, eventually, about 1 out of 10 will take their own lives. A Canadian study found that the direct health care and non-health care costs of schizophrenia were estimated to be 2.02 billion Canadian dollars in 2004. This, combined with a high unemployment rate due to schizophrenia and an added productivity and morbidity and mortality loss of 4.83 billion Canadian dollars, yielded a total cost estimate of 6.85 billion in U.S. and Canadian dollars. • Genetics. Schizophrenia isn’t caused by just one genetic variation, but a complex interplay of genetics and environmental influences. While schizophrenia occurs in 1% of the general population, having a history of family psychosis greatly increases the risk. Schizophrenia occurs at roughly 10% of people who have a first-degree relative with the disorder, such as a parent or sibling. • Environment. Exposure to viruses or malnutrition before birth, particularly in the first and second trimesters has been shown to increase the risk of schizophrenia. Inflammation or autoimmune diseases can also lead to increased immune system. • Brain chemistry. Problems with certain brain chemicals, including neurotransmitters called dopamine and glutamate, may contribute to schizophrenia. Neurotransmitters allow brain cells to communicate with each other. Networks of neurons are likely involved as well. • Drug use. Some studies have suggested that taking mind-altering drugs during teen years and young adulthood can increase the risk of schizophrenia. A growing body of evidence indicates that smoking marijuana increases the risk of psychotic incidents and the risk of ongoing psychotic experiences. The younger and more frequent the use, the greater the risk. Another study has found that smoking marijuana led to earlier onset of schizophrenia and often preceded the manifestation of the illness. Psychotherapy such as cognitive behavioral therapy (CBT) or cognitive enhancement therapy (CET). People who engage in therapeutic interventions often see improvement, and experience greater mental stability. Psychosocial treatments enable people to compensate for or eliminate the barriers caused by their schizophrenia and learn to live successfully. If a person participates in psychosocial rehabilitation, they are more likely to continue taking their medication and less likely to relapse. Some of the more common psychosocial treatments include assertive community treatment (ACT).